Our Rubber Premium Speed Bump is perfect to be placed on residential, commercial, industrial areas, parks, sporting venues and school zones. 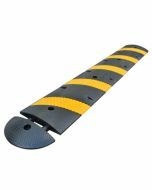 They are very durable and are designed to reduce and control the speed of vehicles in parking lots, roadways, and private lanes. 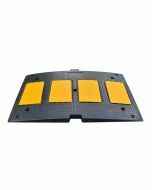 The premium speed bump is manufacture from durable rubber and made with a half of a yellow section that makes this product perfect for safety also providing a beautiful look. End caps available in 2 colors, black and yellow giving the speed bump a more finished look. Great Non-skid surface. Can be assemble very quickly and easy and by just once person, 5 years guarantee and our low price includes hardware. The end cap protects section ends from wear and tear. 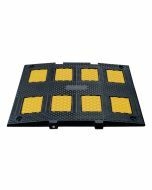 Durable bright rubber yellow section and en cap, great for visibility. Mounting screw NOT included. Select below if you want to add them to your order and if you need them for asphalt or concrete.